Bhopal is one of the few places in India which are surrounded by several national parks and wildlife sanctuaries. 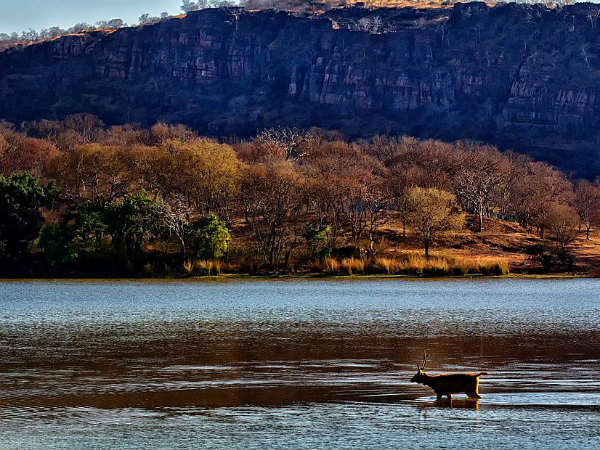 Ranthambore National Park, located at about 480 km from Bhopal, in the state of Rajasthan, is one amongst these few beauties, which make a perfect weekend getaway into the arms of nature and history. The major speciality of this mesmerising national park lies in its historical as well as natural significance. From forts to lakes and palaces to forests, you can find everything within its boundaries. Wouldn't you love to unveil its hidden beauty? So, why refrain from planning a trip from Bhopal to Ranthambore National Park this season? Even though the region in and around Ranthambore National Park experiences a hot weather during the summer season, it remains crowded with photographers and nature lovers throughout the year. Hence, it is a year-round destination for those who are looking forward to capture the beauty of Ranthambore wildlife and its ancient possessions, irrespective of weather and climatic conditions. During the summer season, you can spot tigers easily when they come out in the open near ponds and lakes. By Air: Jaipur Airport is the nearest airport from Ranthambore National Park at a distance of about 140 km. From the airport, you can either catch a bus or hire a taxi to Ranthambore National Park. By Rail: The nearest city from the national park is Sawai Madhopur at about 15 km, which is well connected to nearby cities and towns. You can catch a direct train from Bhopal railway station to Sawai Madhopur and then from there a cab to Ranthambore National Park. By Road: Located at about 480 km from Bhopal, Ranthambore National Park is easily accessible by road. Route 1 will take half an hour lesser in comparison to route 2 and hence, it is advisable to take route 1 as it will take an approximate time of 9 hr to reach your destination. On your way to the national park, take a break at the following places to make your journey wonderful and more enticing. Located at a distance of about 300 km from Bhopal and 190 km from Ranthambore National Park, Shivpuri is famous amongst tourists for its beautiful cenotaphs and ancient temples. Even though Shivpuri also boasts of being a district surrounded by lush greenery and beautiful forests, it is visited mostly by history lovers and local tourists, who come here to comprehend the beauty of its ancient buldings. The major places to visit here include Shivpuri Chhatri, Mohineshwar Dham Mandir, Ban Ganga Dham and Madhav National Park. Sheopur is a beautiful ancient town in Madhya Pradesh at a distance of about 370 km from Bhopal and 80 km from Ranthambore National Park. Famous for its majestic fort, Sheopur is a must-visit en route destination if you are an ardent lover of history and never get tired of exploring ancient places. Sheopur is also famous for its woodcarving skills and hence, you need to visit its market to witness the efficiency of craft persons and their advanced skills in making wooden materials flawlessly. The major places to visit in Sheopur include Sheopur Fort, Dob Kund, Ram-Janaki Temple and Sangam of Rameshwar. Ranthambore National Park is one of the largest and beautiful national parks in India and was formed as a game sanctuary in the year 1955. However, it was converted into a national park in the year 1980 to protect the endangered species of animals and plants which were dropping drastically in their numbers. It has also been declared a tiger reserve and hence, houses numerous Bengal tigers within its boundaries. Ranthambore National Park is visited by thousands of tourists every year, who come here to apprehend the beauty of Bengal tigers and its ancient buildings. Being a tiger reserve, you can find numerous Bengal tigers here. Several other species of animals which you can spot here include the Indian leopard, nilgai, wild boar, striped hyena, chital and sloth bear. Ranthambore National Park is also rich in numerous species of butterflies and flowering plants. During the monsoon season, you can find the entire national park covered with the lush green vegetation in the form of plants and trees. Ranthambore National Park is also a paradise for bird lovers as you can spot hundreds of birds chirping and nesting all around the park. Ranthambore is one of the few national parks within which you can find several places to explore. From forts to palaces, lakes to forests and temples to rich wildlife, there is a lot to witness here. The major tourist attractions in Ranthambore National Park which remain crowded with visitors include Ranthambore Fort, Padam Talab, beautiful meadows, rich forests and wonderful tigers. However, exploring Ranthambore Fort and enjoying wildlife safari are the two things which are carried out by most of the tourists.